Golden Gate Sotheby’s International Realty/YouTubeThe property sits in Tiburon, Calif., about nine miles north as the crow flies from downtown San Francisco. 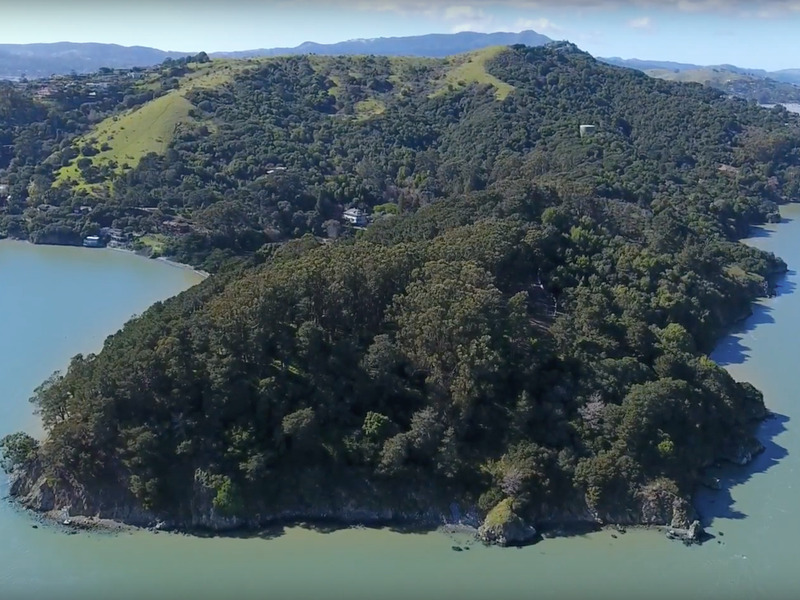 There’s a 14-acre chunk of a peninsula north of San Francisco currently for sale for a whopping $US37 million – and that’s excluding home construction costs. Though the infamously competitive Bay Area real estate market has seen plenty of unique listings, this one is a rarity in that it’s an expansive undeveloped waterfront parcel situated in the tech capital of the world. In the San Francisco Bay Area housing market, it’s not uncommon to find fire-gutted properties listed for a cool $US2 million or a 1-acre dirt lot selling for $US15 million. But it seems the most overheated and competitive real estate market in the nation has finally seen something it’s not used to: a rare 14.73-acre undeveloped waterfront chunk of a peninsula listed for $US37 million. And that’s excluding home construction costs. 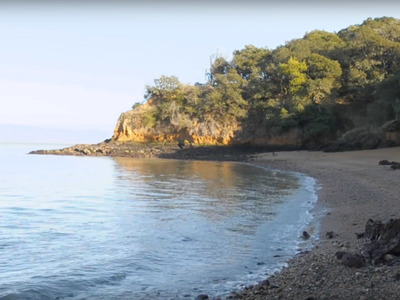 The forested bay front property, known as Bluff Point, at 2800 Paradise Drive in Tiburon, California, sits on the end of the Tiburon Peninsula and spans a whopping 2,000 square feet of shoreline. It offers its future owners an unrivalled bayside oasis, complete with private sandy beaches and views of the Golden Gate Bridge, just an hour from downtown San Francisco. Golden Gate Sotheby’s International Realty/YouTubeThe future owners of the waterfront property will have access to private sandy beaches. The acreage is about 45 minutes by car from downtown San Francisco, though sadly it looks like views of the glistening city lights won’t be seen from the property. Angel Island State Park sits squarely between Bluff’s Point and downtown. You can also reach it via a 45-minute ferry ride to Tiburon. From the ferry’s drop off point to Bluff Point is a seven-minute drive. That commute would be even further if you’re coming from south of the city, from Silicon Valley, which is a strong possibility considering the island’s price tag and opulence would attract the region’s wealthy tech clientele. According to the listing, property plans are approved for a 15,000-square-foot main residence, an estimated 2,200-square-foot guest house and a 700-square-foot “caretaker’s cottage.” And if the listing in and of itself wasn’t rare enough, the property’s ownership has only changed once in the last 100 years. It will change once more when the land finally sells, though its 532 days spent listed on Zillow doesn’t exactly spell a promising forecast. Still, it’s the ultimate private beach paradise nestled in the tech capital of the world. What tech bigwig wouldn’t jump at that?